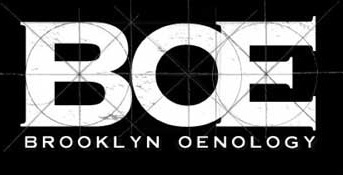 I first discovered “BOE” Brooklyn Oenology a few years ago, when Alie Shaper, BOE’s owner and winemaker extraordinaire, came to the store to introduce her wines. It was the beginning of a beautiful adventure for her, but at that time, when she barely started the operation, she was working on her own: doing tastings, making and promoting wines and delivering them on her own. 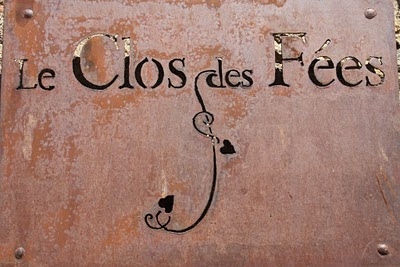 But she was passionate and convinced, and wanted to show her wines to the world. 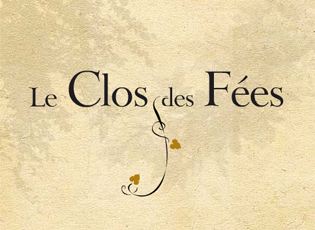 Alie established the company in 2006 and started selling her wines in 2007. Within the last 5 years, she went from being a one person operation to a 7 persons operation. She stumbled into winemaking like someone suddenly realizing that he or she has a purpose or a mission to accomplish, with a simple light bulb idea. But don’t get me wrong, she didn’t develop her passion for wine and winemaking just like that, from one day to the next. No. Well acquainted with wine, she was already working in the wine business for a few years and had already an internship at Premium Wine Group, a winemaking facility on Long Island; but it took a move and the influence of a few new surrounding factors, to really initiate the idea. In 2005, she decided to move to Brooklyn, partly for practical reasons, but mainly because of the significant artistic community and attractive lifestyle of this vibrant and ever-active borough. Once in Brooklyn and already establishing contacts and friendships with the local artists, the brilliant idea of incorporating Wine and Art to celebrate local wine culture and local creativity came to her mind. In 2006, she started to produce wine at her internship facility in the North Fork of Long Island, Premium Wine Group, and established her office in Green Point, the northern neighborhood of Brooklyn, near the young-and-hype Williamsburg. The heights of Kings county throne like an old, yet wise and serene sovereign, overlooking his young and somewhat undisciplined sibling that Manhattan is. And despite its bad and rough reputation, Brooklyn has become a hub for great inventive minds, energetic young entrepreneurs and daring artists. It is a borough of mixed traditions and culture, which combined old established family traditions and respect with outgoing attitude and desire to achieve better. Today, with its many quaint places, lanes, terraces and quiet cul-de-sac, the western neighborhoods of Brooklyn combined some of the most exclusive family-oriented and hype neighborhoods in the city. And atop of being filed with inviting bars, mixologists clubs, small craftsman boutiques, eclectic food markets, modest factories and gourmet restaurants and eclectic art and culture, and much more; Brooklyn also encompasses wineries and breweries and distilleries lead by ingenious and creative people, which have for the past few years helped revived and reestablished Brooklyn needs to shine and demonstrate. 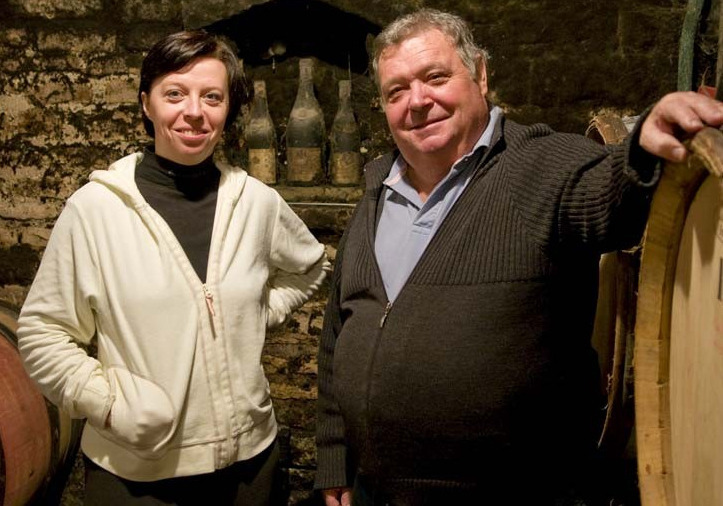 As for BOE, nowadays, 5 years later, Alie is still making wine at the same facility (Premium wine Group), and even continues, from time to time when not too busy or in case of urgent measure, to deliver her wines to certain accounts. From the first few wines of the beginning, she tremendously expanded her portfolio to 14 different labels, most made by local Artists and, for some, conveniently detachable from the bottle. 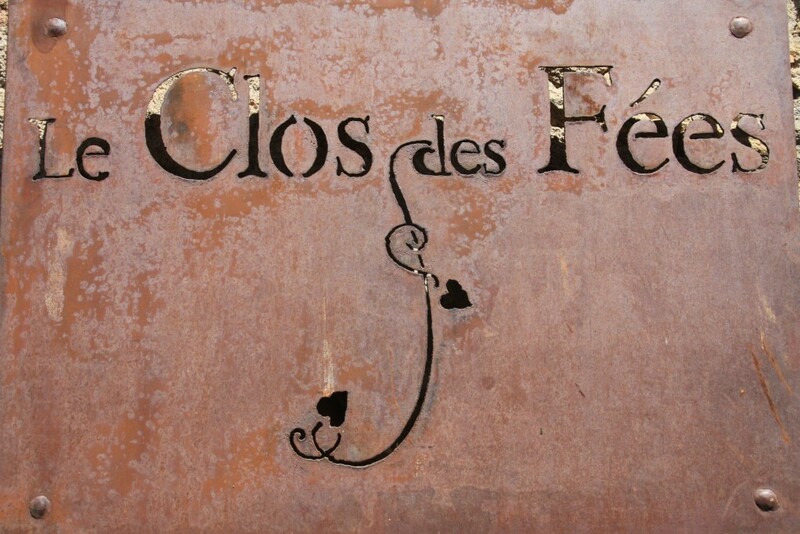 Everything in her concept revolve around Wine and Art, which are blended together into the bottle of course, but also reflected on each label, which somehow, by the colors and forms, auto-suggest in advance the aromas, flavors and overall profile and attitude of the wine. Pretty smart, isn't it? 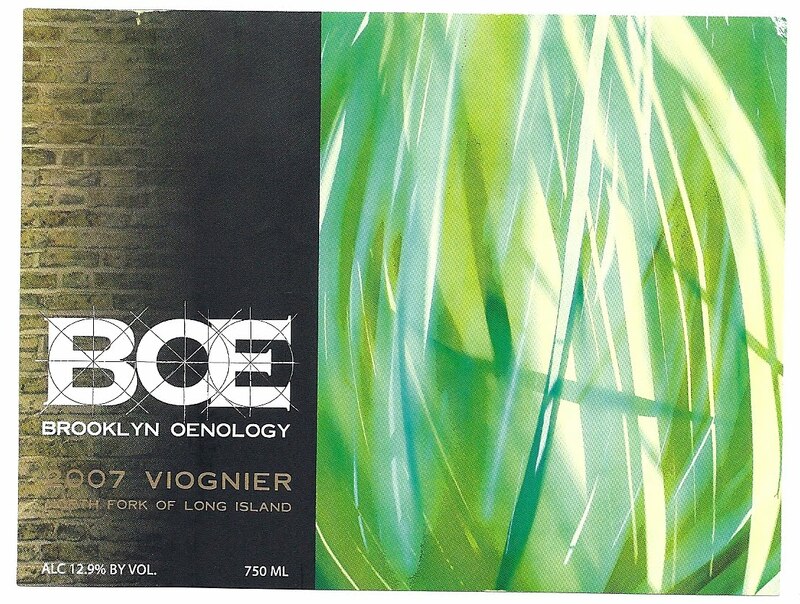 To prove what I was trying to say on the last paragraph, let's take for example the label of the 2007 Viognier: you may see something else, but in my opinion, it looks like a close-up of gently undulating grass on a bright, sunny day due to the movement and the light; it evokes Spring, or Summer, a picnic may be... and yet again, it somehow also gives you the illusion of being in the water or like if you were looking at grass under water just below the surface with the ever-changing light filtering through it; creating in your mind images and sensations of grassiness, minerality, freshness, crispiness, lightness, something with soft, gentle and discrete behavior, yet bright and lively and inviting attitude. And surprisingly, it is also what you get in the bottle when you taste the wine. What a great idea! 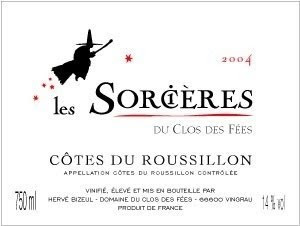 (and it works with pretty much all of her wines, amazing). Let's talk about that Viognier. Like for most of her wines, she sources most of her grapes through various growers of Long Island and this Viognier is no exception. All of her wines are bright and racy with a lot of focus, great acidity and balance, but this Viognier is one of my favorite wines amongst all the ones she introduced me to, since I begin to support her project and ideology a few years ago. 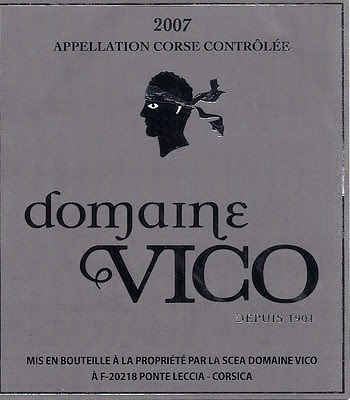 Viognier is a tough grape variety to deal with: floral, mineral, expressive, long, elegant, mouth-coating and lightly oily when well crafted; it can also turn into a tired, dull, fat, viscous and uninteresting wine, if the fruit is too ripe and the overall wine profile lacks the acidity and freshness. 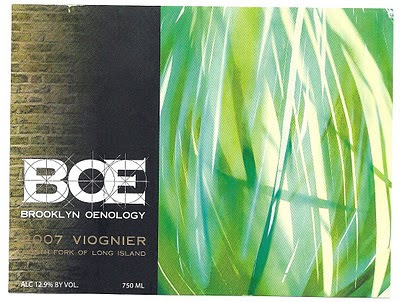 However, this is not the case for 2007 BOE Viognier, which is quite zesty and refreshing. I could have described the taste of this wine myself, like I normally do, but I’m usually too wordy and Alie has a great way on describing it shortly and pleasantly. “Aragus” is one of the numerous labels produced by Bodegas Aragonesas. The Bodega is located in the Campo de Borga Denominación de Origen (DO), in the medieval kingdom of Aragon, with vineyards planted at the foothills of the Iberian Mountain Range, in the northwest of the province of Zaragoza. It is a transition zone between the plains of the River Ebro and the mountains of the Sistema Ibérico, which includes the foot of the Iberian Mountain Range and the high valley of the Ebro River, two important geographic and topographic factors also shared by neighboring ancient kingdom and wine regions “Navarra” and “La Rioja”. Although less recognized than its two more regarded neighbors, Campo de Borja, which for the past 5-6 years enjoyed climbing notoriety for producing easy-going and affordable wines even when produced from old vines, is also a privileged and long established area for growing vineyards, both due to the quality of the soil, the ideal climate and the centuries of savoir-faire, where countless inexpensive yet rewarding wines are exponentially produced. 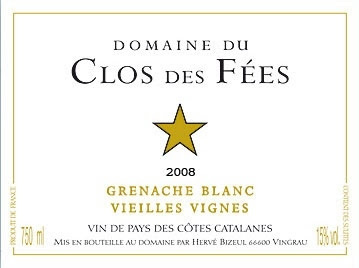 Grenache, or Garnacha, is the predominant grape variety grown in Aragon and more importantly Campo de Borja, producing juicy, earthy and slightly spicy wines with generous amount of ripe dark fruit and versatility to complement a wide array of dishes and gently agreement any occasions. Other grapes like the irreplaceable Tempranillo, but also more international grapes like Cabernet Sauvignon, Merlot and Syrah often complement Garnacha. Moreover, I couldn't find or make a good picture of the label, so here is the label of the Garnacha-Cabernet Sauvignon which is about the same and will give you a good idea. A blend of 85% old vines Garnacha and 15% Syrah, this little wine isn’t the most complex, yet it is pretty enjoyable and easy to drink. Behind its medium dark, ruby color, the nose at first, then the palate, delivers generous ripe juicy red and dark fruit aromas and flavors intermingled with earthy, floral and slightly toasted notes and hints of chocolate. 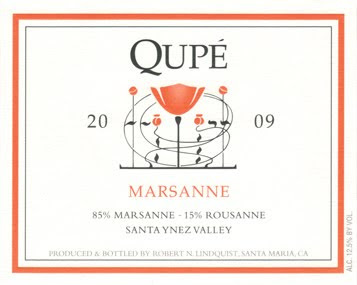 Following a soft, round palate with good balance and medium built between the ripe fruit, the acidity and the present yet fairly integrated tannins; the lingering finish has a good grip with earthy, spicy nuances, which makes this rather inexpensive wine a crowd pleaser and a great everyday red to enjoy at anytime with “charcuterie” based hors-d’oeuvres and grilled and / or BBQ meats. Wines in retail store: Standing Up or Laying Down bottle? Standing Up or Laying Down bottle? Very often, when my customers come to the store and pick up one or more bottles from the shelves, they inadvertently take the first one(s) they see, which, generally and in most case scenarios, end up being the one(s) standing up. At Heights Chateau, the bottles are stored on beautiful antic-like library shelves, with one bottle (for display) standing up in front of a few more bottles (about 6-8 bottles), which are (usually) stored vertically (forming a column) with the bottles at the horizontal (lying down on their side) on top of each other (see picture above). As the store's manager and wine director, I'm concerned about the quality of the bottle(s) they pick, and thus, unless they don’t have any other choice, I always let them know that it will be better for them to choose one of the bottles laying down in the back rather than the one standing up (facing them). Consequently and irremediably, I am (nearly every time) faced with the same unavoidable question: Why? Why can't I buy the bottle standing up? Well, there is surely countless amounts of reasons I could give for you not to buy the bottle standing up, yet, among them, the following 4 ones seem (to me) the most obvious and logical. 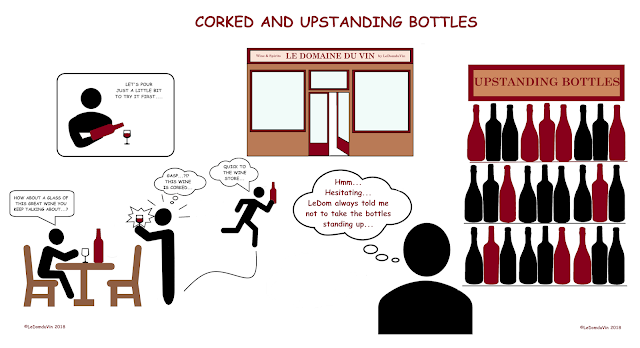 And these are usually the reasons I give to my customers, when having to choose a bottle of wine in a retail store (whether it is a niche wine boutique store or a supermarket, or anywhere else you buy your wine from for that matter), and explaining why they should avoid taking the one(s) standing up. 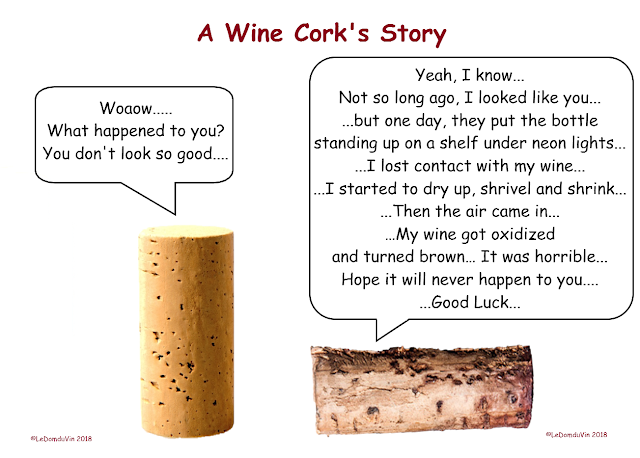 The first reason that comes to mind is that the bottles standing up might be affected by "dry cork and oxidation". Due to lack of the inventory's turnover on the shelves and/or, (even worst), if all the bottles on the shelves are standing up (like in a supermarket), and more especially for the bottles that have been corked with a real tree "cork" (and even for the ones that are made out of agglomerate cork to some extend, but not for the synthetic ones (*)), the cork may have dried out (due to lack of contact with the wine inside), and let some air enter the bottle, which may have resulted in some oxidation of the wine in the bottle. Once oxidized, a wine is bad and deteriorates rather quickly (especially if the bottle is left standing up), and its color tend to become dull and brownish (for red wines). That is the first and main reason why one should always choose to take a bottle from the ones that are laying down rather than from the ones standing up on the shelves. (*) Screw-tap and plastic-like-synthetic corked bottles are usually less or rarely exposed to this kind of problem, but there again, it may happen, especially with bad or loose screw-tap caps. ...then, immediately put the cork back and bring the bottle back to the store (where you bought it from) with what is left of wine in the bottle. Do not pour the wine out in the sink (like most people do), as you might still have a chance to get your money back or get to choose another bottle as a replacement of the bad one (obviously that entirely depends of the type of store and store management you will face... you might need a tiny bit of luck too). However, whether A, B or C (Shh.... not D we told you... ), just remember that the store needs the bottle, the cork (if possible) and (more importantly) the wine inside in order to taste it, to agree or disagree (that the wine is faulty or not), and if agreed to let you choose another bottle at the same or similar price and/or refund you (depending on their policy and also the understanding and kindness of the store manager). They also need the bottle with the wine inside for them to make, in turn, a claim and try to get the bottle replaced or a get a credit back from their suppliers/distributors. 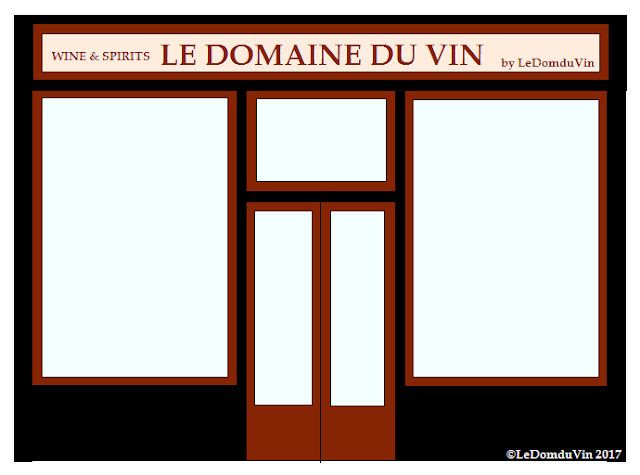 The store should normally exchange it for a new one or another wine of your choice at the same or similar price (if they are nice and if they want to keep your business... at least that is what I do). That say, as a wine being oxidized doesn’t happen too often, and being corked either, that is if your local wine shop is doing the right thing and if you have the right customer profile (in their eyes)... Otherwise, forget about it, most stores management and/or policy will totally ignore your request and probably won't even acknowledge you. The second reason is that the standing up bottles on the shelves, (usually the ones on display to identify the other bottles lying in the back), are always the ones that people grab, check, shake and (too often) put back without buying it, and with no consideration whatsoever for the poor wine all shaken inside the bottle. Wine doesn’t like to be shaken. Do you? The third reason is that the standing up bottles (especially the ones on display) are always the ones which receive the most light, usually the lights from inside the store (generally cheap neon fixtures glaring from the ceiling), but also from outside the store, like the sun light (yet, and obviously, that entirely depends on the store plan configuration and how large and close to the wine shelves the store's windows are... duh....). Light usually discolors the wine. It fades or dulls the color of the wine, which may becomes lighter at first than may darken into a dullish-brownish color. In parallel, light may also affect the aging of the wine too (aging or reaching its peak prematurely) (**). And (fortunately), that is the main reason why wine (in general), and more especially red wine, which often needs a minimum of time to age in the bottle, always come in darker colored bottles (green, dark green, brown, amber or even black), to filter the light and more especially some of the harmful UV rays, and thus prevent the light from discoloring and damaging the wine in the bottle. 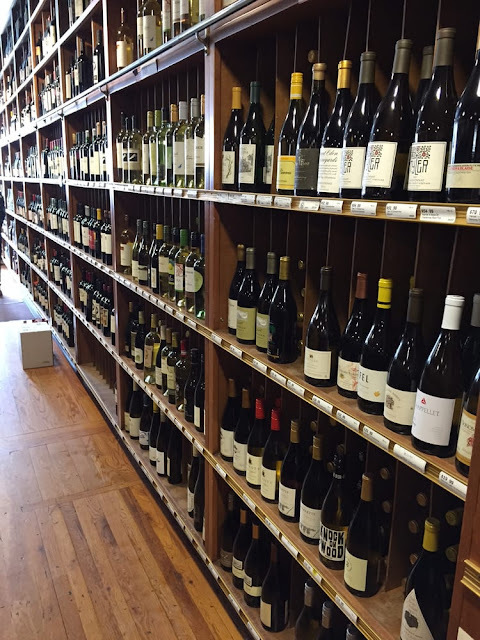 It might not matter much for wines made for immediate consumption, which are usually inexpensive enough to have a good turnover and thus move faster from the shelves. Like young white and rosé wines, for example, which (usually) come in transparent or lighter colored bottles for color identification purposes (and maybe for aesthetic purposes too). Yet, it definitely matters for top tier, expensive and high quality wines (more especially reds, but also some whites), which usually come in darker colored bottles protecting them from the light, as they usually need more aging time in the bottle. 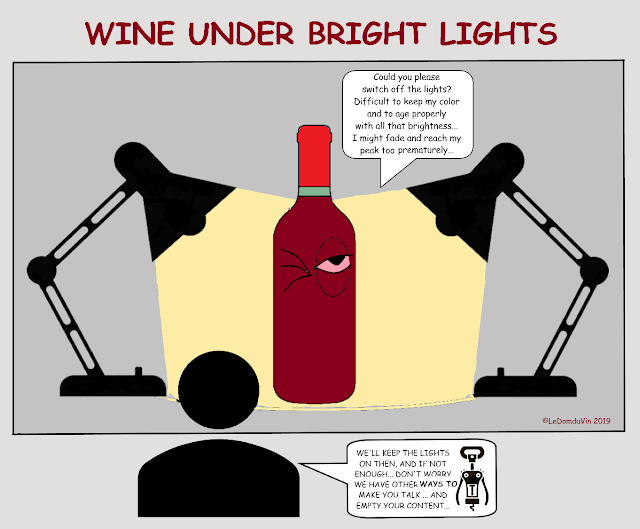 (**) I have also read that light, among other faults, may also cause oxidation in the wine. I definitely agree for the faults that might include side effects and changes in the wine chemical composition/reaction due to the degradation of the color and pigmentation/sedimentation/residues/ components of the wine, harmed by the UV rays of the light. However, I have doubts regarding the "oxidation" of the wine by the light, as oxidation usually occurs via/through air contact, and air cannot pass through glass, as glass is impermeable to gases and liquids and is nonporous (meaning that light can pass through it but not air, nor gas or liquid). The fourth reason is that, as the wine gets older in the bottle, the sedimentation naturally occurs and thus sediments form inside the bottle as the wine ages and matures (***). 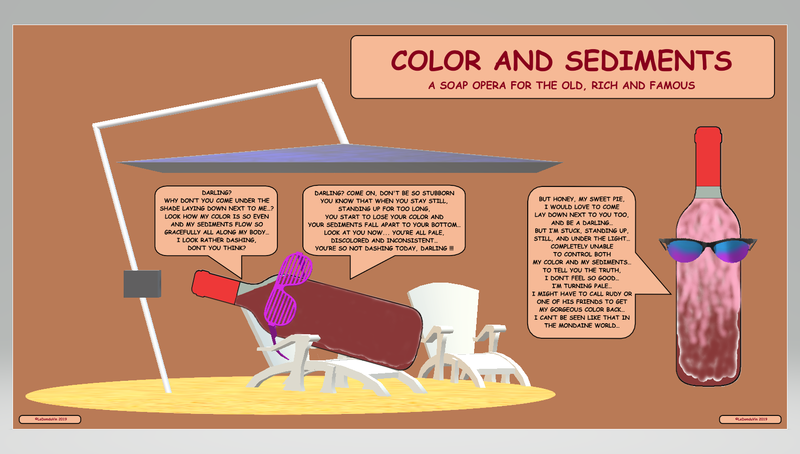 These sediments consist of a combination or mixture of micro-particles, composed of debris of solid matter, as well as color pigments and other wine component's residues in suspension. If the bottle is left standing up and the suspension is left undisturbed, these micro-particles, color pigments and other residues, will gradually fall towards and likely settle at the bottom of the bottle (in the punt). Understandably, if the bottle is left standing up, and more especially if it is an older wine/vintage, all the sedimentation will fall down at the bottom of the bottle, and as a consequence (and due to the fragility of older wines), the consistency of the color, but also the taste (of the wine of this particular bottle) will be irrevocably disturbed/changed. 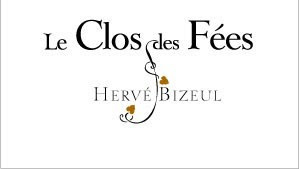 The color of the wine will fade gradually from the upper part of the bottle (logically being more concentrated at the bottom than the top) and the wine will taste slightly dull and unbalanced, lacking of focus in aromas and flavors. I never repeat it enough, but it is really, really important to keep these old ladies at an horizontal position (meaning on their side, and not standing up) for the sedimentation (or the sediments if you prefer) to rest at the bottom along the side of the bottle. That way, the sediments remain in contact with most of the wine contained in the bottle allowing it to keep its color and taste consistency. (***) Sedimentation usually occurs for most wines (yes, even whites), and more especially the wines that did not undergo any "soutirage" (racking), nor "collage" (fining) or filtration during the vinification, the aging in stainless still vats or wooden barrels and/or prior bottling. 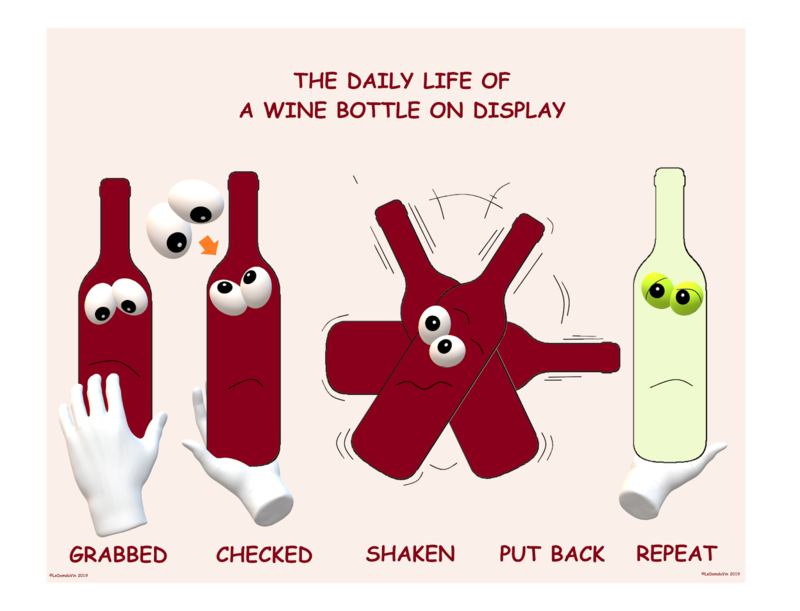 In short, and for these 4 main reasons above, while shopping and browsing around for some good bottles of "JaJa" (a synonym of "wine") at your local wine boutique store (like at Heights Chateau), you should always choose the bottles laying down rather than the ones standing up.